The four Almirante Padilla Class frigates are in service with the Colombian Navy. 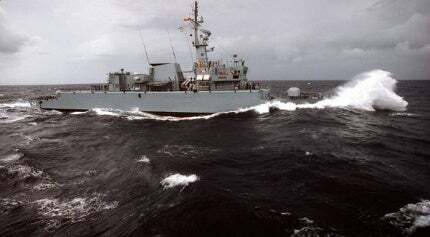 The second frigate in the series, Caldas (FM-52), entered into service in February 1984. The flight deck of Almirante Padilla Class features NVG compatible lighting systems. The Almirante Padilla Class frigates are powered by four MTU 1163 TB 73L engines. The Almirante Padilla Class frigates can sail at a speed of 27kt. Four Almirante Padilla Class frigates designed and built by Howaldtswerke-Deutsche Werft (HDW) are in service with the Colombian Navy. The frigates are used to conduct missions such as anti-piracy, anti-smuggling and counter-terrorism. They are also deployed in patrol missions across Caribbean and Pacific waters. The Almirante Padilla fleet was upgraded to provide improved performance for the Colombian Navy. The modernised vessels completed sea acceptance tests in March 2014. The lead vessel in the class, Almirante Padilla (FM-51), participated in the Rim of the Pacific (RIMPAC) 2014 maritime exercise held in the vicinity of the Hawaiian Islands. The frigates were built at HWD Shipyard in Kiel, Germany. The first frigate, Almirante Padilla (FM-51), was commissioned in October 1983. The second in the series, Caldas (FM-52), entered service in February 1984, followed by the third and fourth vessels Antioquia (FM-53) and Independiente (FM-54), which were commissioned in April 1984 and July 1984 respectively. The Colombian Navy selected Scanter 2001 X-band surface surveillance radars from Terma for the overhaul of Almirante Padilla Class in January 2008. The comprehensive modernisation programme was initiated by the Colombian authorities in early 2009. DCNS was selected as the prime contractor, while Thales acted as the lead systems integrator for the combat system and communications suite. The propulsion system, sensors, sonar and other electronic monitoring systems were modernised under the programme, and this modernisation work was carried out at the Cotecmar naval dockyard in Colombia. The Almirante Padilla Class is based on the Blohm + Voss FS 1500 compact design. The vessels can perform reliably and efficiently in all weather conditions. Each frigate has a length of 99.1m, a beam of 11.3m, a draft of 3.7m and weighs 2,130t when fully loaded. The vessel can accommodate a crew of up to 91 people and offers superior comfort and safety. A flight deck is fitted to support helicopter operations. It is mounted with four Linksrechts lighting systems, compatible with night vision goggle (NVG) capabilities. The command, control, communications and information (C3I) systems aboard the frigate include the Tacticos combat management system (CMS), the Mk3 multi-function operator console, a Link Y Mk2 tactical data link and a TSB 2520 Infrared Friend-or-Foe (IFF). The Almirante Padilla Class frigates have SMART-S Mk2 3D multi beam surveillance radars supplied by Thales. The SMART-S Mk2 radar provides air and surface surveillance and target designation up to 250km. Karel Doorman is a joint logistic support ship designed and manufactured by Damen Schelde Naval Shipbuilding (DSNS), for the Royal Netherlands Navy. The vessels are also equipped with the Thales STING-EO Mk2 electro-optic weapon control system, which provides automatic acquisition, detection of targets and fire control for missiles and guns. A Mirador electro-optical multi-sensor is also incorporated into the vessel to offer surveillance, target tracking and fire control. Other sensors fitted in the frigates include an advanced Vigile 200S electronic support measures (ESM) system, upgraded Altesse communications intelligence (COMINT) systems, Thomson-CSF Sea Tiger radars, and hull mounted Atlas Elektronik ASO 4-2 sonar system. The Almirante Padilla Class is armed with two Mistral Simbad twin anti-air defence missile systems, eight MM40 Exocet anti-ship missiles, two twin Breda 40/70mm guns, four twin Oerlikon 30/75 Mk 74 cannons and two 324mm triple tubes mounts. The frigates are also armed with an OTO Melara 76/62 Super Rapid medium calibre, rapid-fire naval gun, which can fire 120 rounds a minute. The frigates are fitted with Terma’s Soft Kill Weapon System (SKWS) decoy launching system, which can fire all types of existing 130mm decoys while providing 360° horizontal coverage. The modernised Almirante Padilla Class frigates are powered by four 16-cylinder MTU 1163 TB 73L diesel engines developed by Rolls-Royce Power Systems. Each engine weighs 22.8t and produces a power of 4,290kW at 1,160rpm to 1,200rpm. The power-to-weight ratio is 3.1kg/kW and the power-to-volume ratio is more than 200kW/m³. The pairs of twin engines in the combined diesel and diesel (CODAD) configuration are coupled to an upgraded controllable-pitch propeller via a multi-engine gearbox system and a propeller shaft. The vessels are installed with double resilient mounting systems for structure-bourne noise reduction by up to 40%. Water-cooled exhaust lines and sequential turbo-charging systems are installed for airbourne noise reduction. The frigates also feature MTU’s integrated, intuitively operable Callosum automation system to monitor and control all areas and functions of the propulsion plant. The new four eight-cylinder Series 2000 generator sets power the galley, radar, communications and electric pump drives. The propulsion system provides a speed of 27kt and a maximum range of 7,000nmi at 14kt. This project forms part of our recent analysis and forecasts of the global naval surface combatants and warfare systems market available from our business information platform Strategic Defence Intelligence. For more information click here or contact us: EMEA: +44 20 7936 6783; Americas: +1 415 439 4914; Asia Pacific: +61 2 9947 9709 or via email. MTG Marinetechnik GmbH is a highly experienced naval consultant with more than 50 years of involvement in ship design concepts and all aspects of the procurement process such as requirements management, cost analysis, personnel / crew models, simulations, as well as survivability reports.